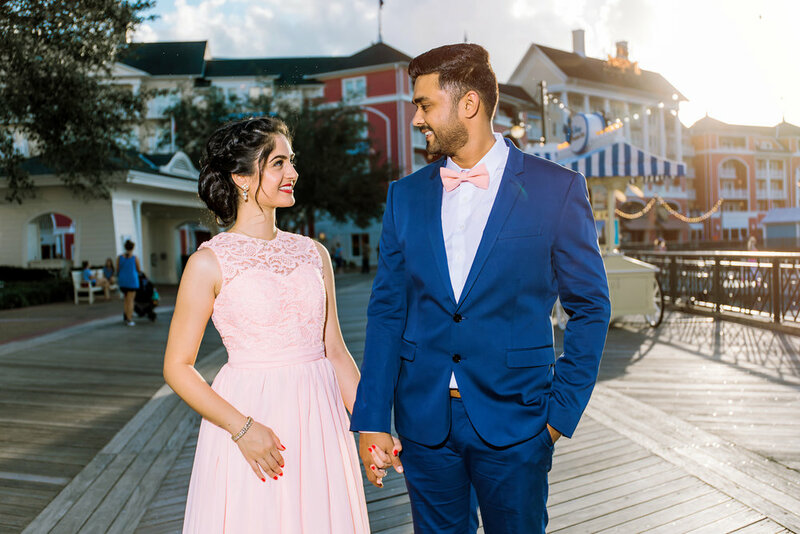 As you may already know- I photograph quite a lot of engagement sessions at Disney’s Boardwalk- thanks to my Instagram Page and Pinterest Page. I'm so happy to share Carolyn and Philips sneak peek on my blog today! First of all, let me tell you a bit about my girl Carolyn. She loves her dog Mio just as much as I love my baby Bindi (check out the adorable pictures below). We met through an event Planning company where she works while I was photographing an event for them at DR Phillips Center. 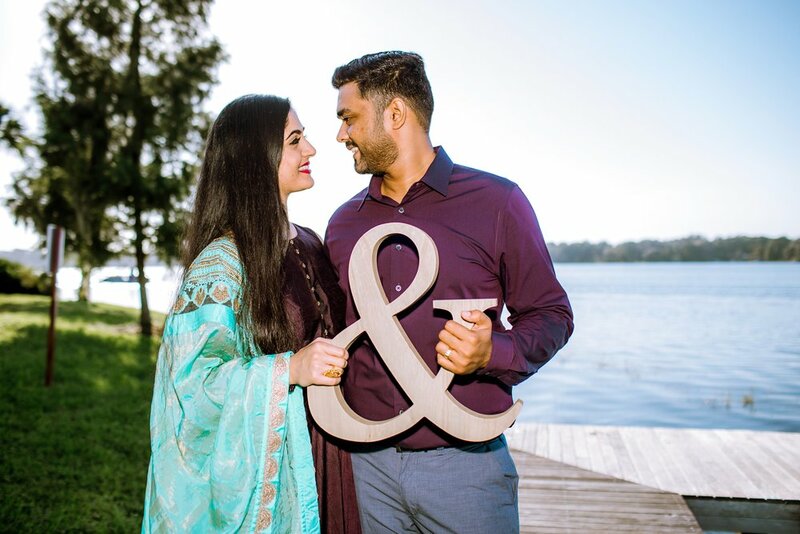 We bonded during their engagement session at Bok Towers where we had quite the adventure! We got to enjoy a few long meals together after that! Carolyn is the most bubbly, stylish and kind hearted woman. And then there is Phil- funny, tall, handsome and Carolyn's love of her life. They are just the perfect pair and I was so honored to be their wedding photographer. 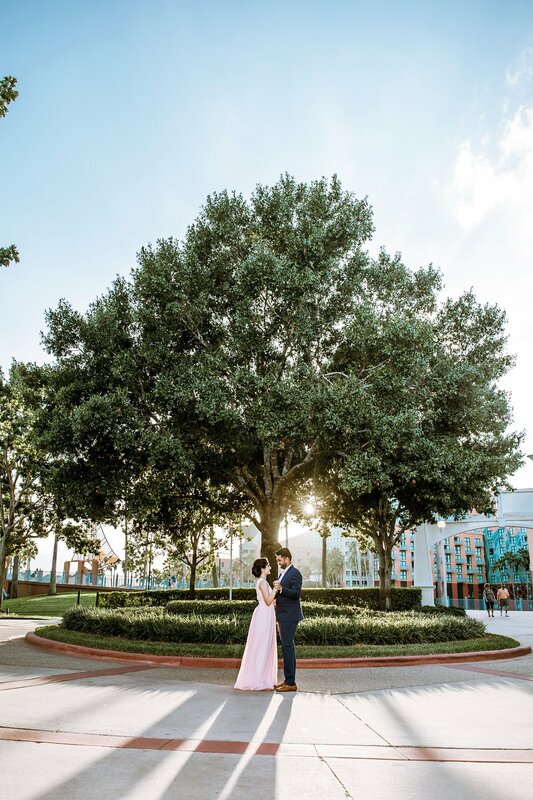 Phil and Carolyn met while both were working at Disney's Animal Kingdom Lodge. Fast forward a bit to a quiet day when both were off from work. Phil had prepared a beautiful breakfast for them to enjoy. She discovered that Mio had a ring tied to his neck. Phil then got down on one knee and asked Carolyn to spend the rest of her life with him. How Romantic and Sweet! 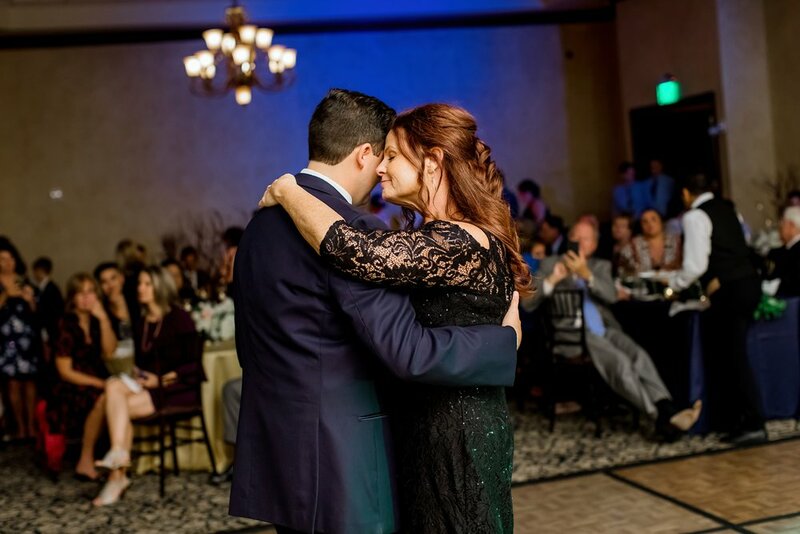 When asked what they love the most about each other, Carolyn says that she loves Phil's sense of humor and adventurous spirit while Phil loves her beautiful face and that she enjoys eats weird / exotic stuff (testimonial to his humor!). 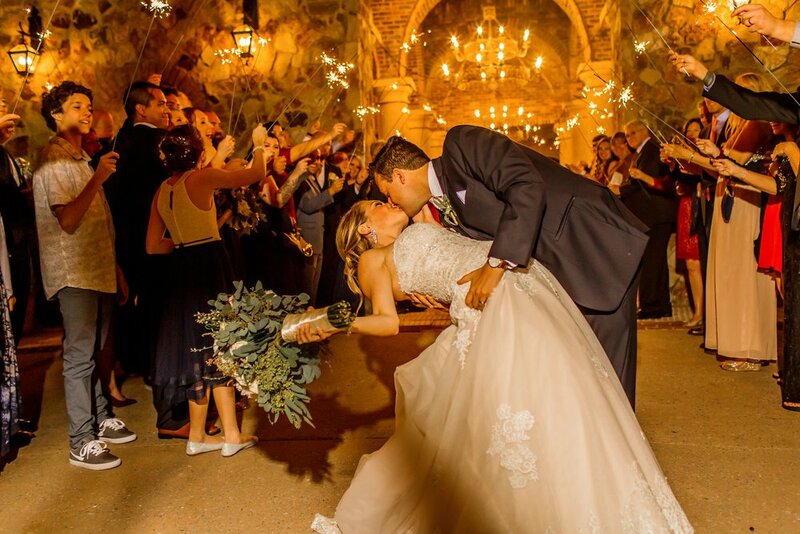 The couple tied the knot at the Stunning Bella Collina with a traditional wedding. The wedding season is here along with slowly increasing cooler weather. I have a ton of engagement sessions scheduled along with a handful of proposals over the holidays. Wedding photography is becoming more and more circulated thanks to image driving social media. 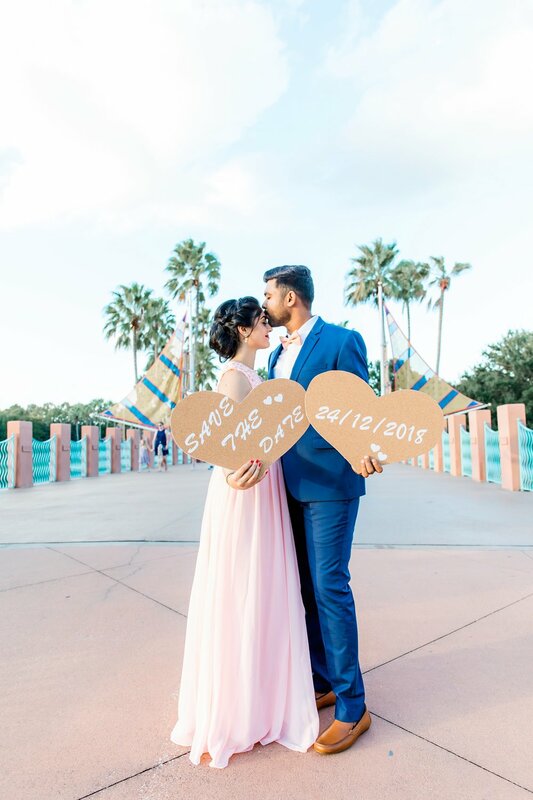 Wedding and engagement photography inspirations can be pulled up using Wedding Hashtags on Instagram or on Pinterest. Social media is such an integral part of everyone’s lives now and is how many of my couples discover my work! That brings me to Sonal and Nirav, who reached out to me after discovering my work online. Let me just tell you- it was Love at first site. We scheduled a meeting at a chic cafe in Winter Park to chat about her vision. We ended up speaking about our lives, laughing, sharing our love for travels and snapping pictures of our latte’s (she totally gets me!). Fast forward to our scheduled session and I felt like I was photographing old friends. 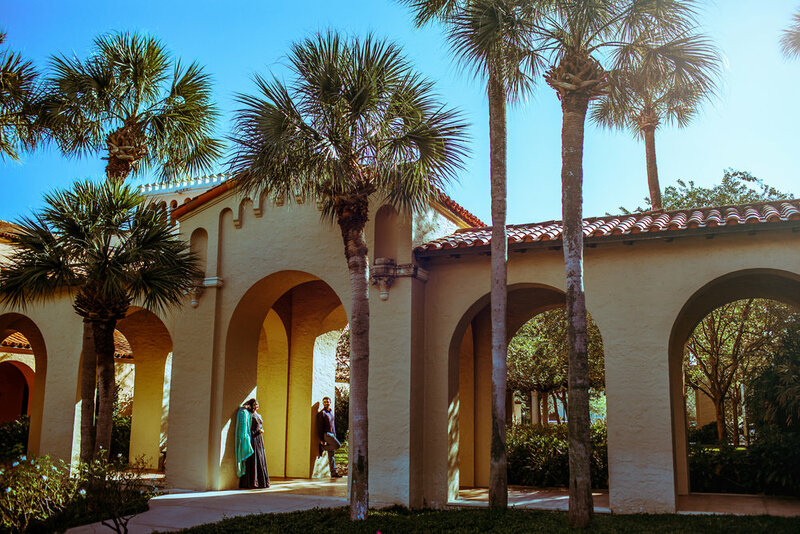 We started the session at Kraft Azalea Garden early in the morning to catch the sunrise and then headed to Rollins College to photograph around the campus. 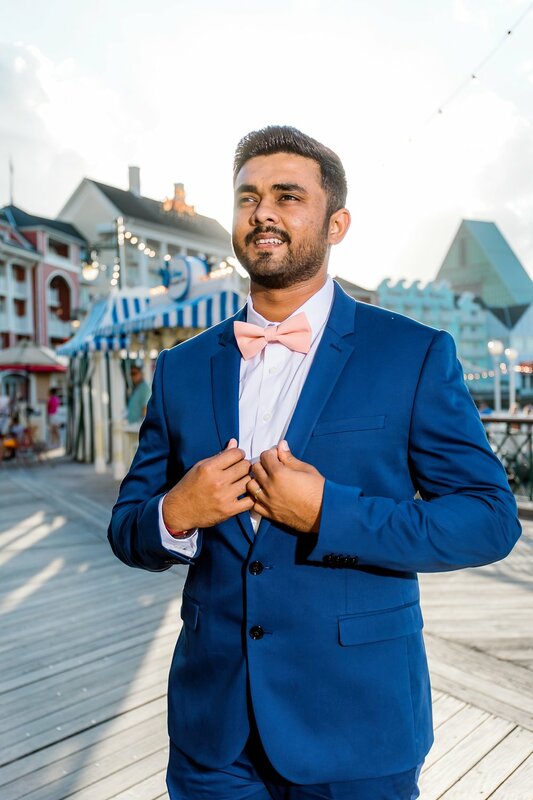 The session continued the next day at one of my favorite locations- Disney’s Boardwalk and we caught a beautiful sunset! They scheduled two engagement sessions back to back to get a wide variety of images and to fit in more outfit changes. It was TOTALLY worth it! 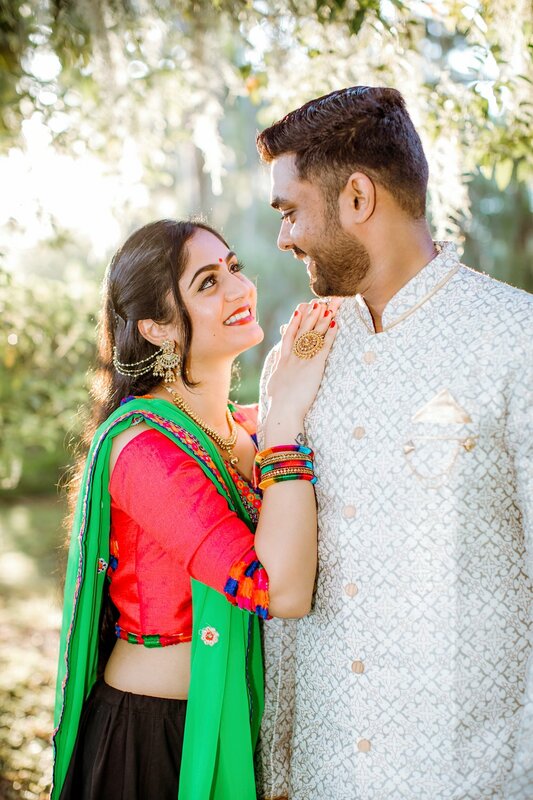 These images will be displayed at their Wedding this December in India! 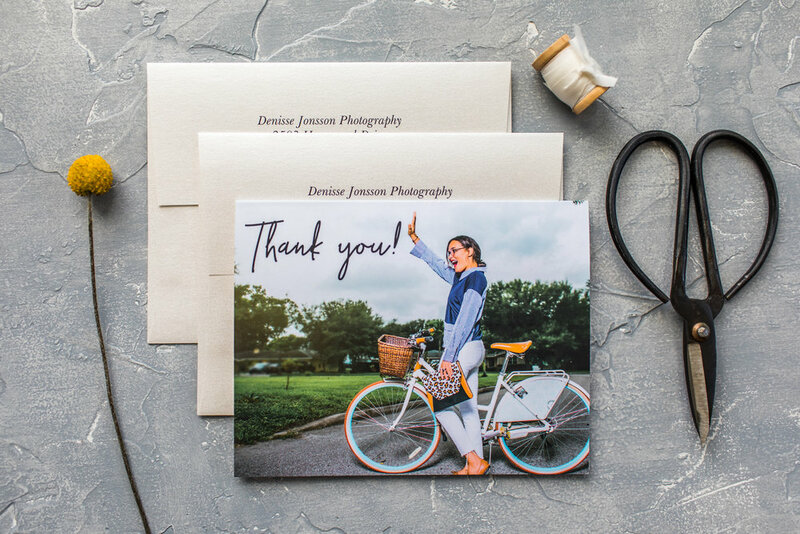 I love sharing everything that I learned during my journey as a business owner and these Beautiful Custom thank you cards for Entrepreneurs is another way of me sharing what I love. In the early stages of my business (and still to this day) I turned to resources such as blogs, other photographers and even YouTube searching for way's to improve my business and client experience. One crucial aspect of my business is my relationship with my customers. I've found that going the extra mile by doing little things like sending gifts, tips and thank you cards ensure that my clients are left as raving fans well after the images have been delivered. I am a lover of pretty stationary and thank you cards. I send out thank you cards to clients every Monday morning. It has become a ritual of mine and a practice of gratitude and positive affirmations. I have a large collection of thank you cards in a cabinet labeled "Stationary" in my office (yes they have their own cabinet!) and have tried numerous printing labs to create beautiful custom stationery that represents my brand. But none of them have come close to the quality found through a company that I recently ordered from called Basic Invite. Don't let the name fool you because there is nothing basic about their carefully curated and unique products including the gorgeous thank you cards that I ordered. They also have beautiful wedding Invitation designs! Basic Invite are my newest obsession with thank you cards! The paper that I used is their Luxe Velvet paper (that feels softer than butter) which is super sturdy yet feels like cashmere in your hands. I also ordered their festive shimmer envelopes to complete the set. These thank you cards have already brought great feedback from its recipients. I received a message earlier this week asking "Where did you get your thank you card", which brought me to write this blog post for all of you. Because sharing is caring!